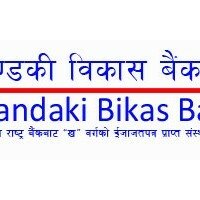 Gandaki Bikash Bank Limited is first and one of the leading Bank of Pokhara. The Bank is established under the Company Act 2063 and the Bank and Financial Institution Act 2063 at New Road Pokhara in Magh 12 2061 B.S. It is “B” class development Bank licensed by Nepal Rastra Bank (Central Bank of Nepal). The main objective of the bank is to collect the unproductive small, fragmented and large amount of money scattered in different sector of society and deploy that integrated fund in effective and productive sector. So also to provide better services to it’s existing clients, prospective clients, various related/ non-related institutions, directly related and non-related different aspects of the society so also to the nation through the best banking services by making them to accustom the sophisticated technology that has been used in banking service sector . Similarly, their objective is also to serve the people of that sector who actually need banking service sector and make their habit of doing and practicing by utilizing the best services ever provided by their bank. The bank proudly can say that according to their objective they have launched many branches in virgin markets of remote area such as Gorkha, Mugling, Beshishar, kawasoti, chormara etc. Their very efficient and competent board has very impressive vision and goal to contribute in banking service sector. The bank recently going to issue right shares to collect capital from the existing shareholders to fulfill it’s vision. By issuing right shares than bank will have further increment of Rs 100 million as capital. The portion of that capital will be utilized in opening new branches in various parts of the country. Very recently the bank is going to launch four new branches in feasible area of the country. The bank is going to adopt the ATM machine to provide fast and effective service to it’s praise worthy customer and so also internet banking, SMS banking and other new technology adopted by similar banking industry. Similarly, they are going to make various networks to other commercial bank, development bank, financial institutions and various remit service sector to facilitate remittance service to the clients. At present, they are dealing in regional area but in the near future they are going to make their bank at National level development bank to provide it’s best services as nationwide. As they are in path of achieving their vision and mission the prestigious magazine nominated us in the best 10 development bank of the country. They put their sincere effort to make the 1st National development Bank of the country. Authorised Capital : Rs 400,000,000. Paid up Capital : Rs 320,000,000. Sophisticated software well known Pumori Plus III, Centralised Server based system and networking is performed by World Link and Subisu Cable providers. The bank provide the remittance services also which assist people to get their money within no time. The bank provide the easy services to all the prospective clients and existing clients by which they think it assists in augmenting the corporate image. They provide education loan, foreign employment loan and deprive loan to flourish the particular section of the society to give them chance and utilize their entrepreneurship in their best interest area from which they are contributing to those people who have enthusiasm, knowledge, dynamic attitude, skill and pleasant behavior but lack the economic to shape their ideas and hence to develop the nation as a whole.